A current eBay auction has what would be, for me, the earliest recorded Contempora instrument, a trumpet with a serial number of 21025. 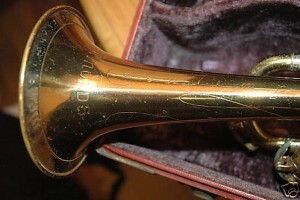 This is the second Contempora model horn with a serial number around 21xxx that I’ve noted this year. According to trademark documents, the first usage of the Contempora brand was in 1949. Dating SN 21000 to 1949 would have a few implications: first, the design changes noted on the Reynolds/Professional models around SN 22000 may have happened after the Emperor (1947) and Contempora (1949) models were developed, or as a result of them. Second, if SN 30000 still lines up with 1952-53 (see below), then this also means an accelerated production rate, though with the addition of the Emperor and Contempora model lines, this might be expected. 1946/47 — Reynolds sold to Scherl & Roth. No immediate changes to instruments. Marketing materials indicate that Reynolds is a division of Scherl & Roth. 1947 — Emperor line introduced. If estimates are correct, the initial serial numbers should be slightly under 20000. However, the lowest observed number is just under 25000. 1949 — Contempora line introduced. Serial number 21000. 1949/50 — Design changes to Reynolds cornets and trumpets (valve caps) and trombones (major redesign) — SN 22000. It is now assumed that these design changes have been previously introduced on the Emperor and Contempora lines. 1952/53 — Instruments marked “Made by Roth-Reynolds” around SN 30000. Another implication is that the other Reynolds instruments may have switched from Reynolds to Contempora models later than 1949. For example, several low brass instruments still bear the FA Reynolds engraving with serial numbers in the mid 20000’s, or c.1951. This entry was posted in Updates & News and tagged contempora, eBay, trumpets. Bookmark the permalink. Both comments and trackbacks are currently closed. I thought you may be interested to know that I’ve just acquired this self same trumpet. I bought it on eBay from a guy in Birmingham (England, not Alabama!) and it arrived today. It’s not too pretty but I’ve had a first blow and I must say I’m impressed! All seems OK mechanically apart from some valve wear mainly to 1st valve, but not enough to significantly affect playability (though I’m only an amateur player). I’m now considering if and to what extent to restore it. Would you say this horn has particular significance/intrinsic value, and hence should I leave it as is? Any thoughts welcome! Brian – thanks for updating the story of this trumpet! Restoration is always a personal issue, so I hesitate to tell you what to do one way or another, but if the horn plays well and there are no material or mechanical issues hindering your playing, why not leave it in its historical beauty?